RIGIGEL: NO ORDINARY GEL PACK. 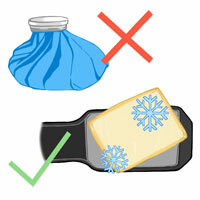 The best way to treat the pain and swelling experienced following an injury is to apply cold to the injured area. Often patients will use painkillers to deal with discomfort relating to their injury, but using this method is dangerous. Painkillers do nothing to treat the pain or inflammation associated with an injury, merely covering up the damage or even making the injury worse. Instead of painkillers, use cold to relieve this pain safely and effectively. The problem with many ice gels is that they do not properly distribute cold evenly over the whole injury, and do not stay cold for long. The way to fix this problem is to use a ColdCure® cold compression wrap. 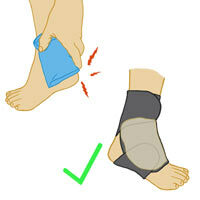 ColdCure® wraps use thicker, bigger wraps that hold their shape to keep the cold on the injury. Most ordinary gels are very thin and don't hold much gel. The gel they do hold can't even stay on the injury, instead moving around unevenly when pressure is applied. This makes most ordinary gels ineffective for treating injuries. ColdCure® wraps, however, use RigiGel® gel packs that are much bigger and thicker than regular ones, and hold their shape instead of flowing away when compression is introduced. RigiGel® gel packs offer superior temperature balancing as well in addition to the sheer amount of rigid gel, ensuring the entire injured area receives an equal amount of relief from pain and swelling. It's common for many people to put ice on their injuries to relieve pain and keep swelling down. However, they are only putting themselves at risk of further damage to their tissue. Ice from the freezer is too cold and can often burn the skin over the injury. To solve this, ColdCure® RigiGel® is designed to be stored in the fridge, where it is not too cold to burn but is more than enough to treat pain and inflammation. There's no need to put yourself at further risk. ➙Click here for more information on ColdCure treatments! Each ColdCure® wrap is made of soft, comfortable Neoprene. They are designed with quality in mind for patients to enjoy wearing. The wraps are built to be injury-specific; there is a variety of wraps in shapes that fit the forms of many common injured body parts such as the knee or shoulder. Their unique shape allows for the best and most comfortable coverage for the entire injured area. RigiGel® technology is one of the key components in the design of ColdCure® wraps. The wraps combine the benefits of cold therapy with compression and comfort, improving on all the models to create the ultimate pain and swelling solution. It's recommended that patients start using a ColdCure® wrap following an injury to alleviate the discomfort and swelling. With the cold and compression aspects working together along with the powerful RigiGel® and Perpachill® technologies, ColdCure® provides the best possible solution to post-injury pain and swelling.